Grayrock, Texas, AKA Gray Rock, Texas. Settled even before the organization of the county, Gray Rock (as it was then-known) had a post office in 1848. By the mid 1880s the community had an estimated population of fifty, increasing to 150 ten years later. The post office closed in 1906 but the town continued to hold on into the 1930s when it consisted of just a store and scattered residences. By 1985 only the cemetery was left and the scattered houses had become widely scattered. 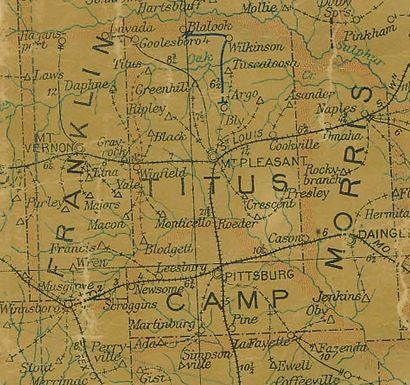 1907 postal map showing Grayrock between Mt Vernon and Mt. Pleasant Courtesy Texas General Land Office.